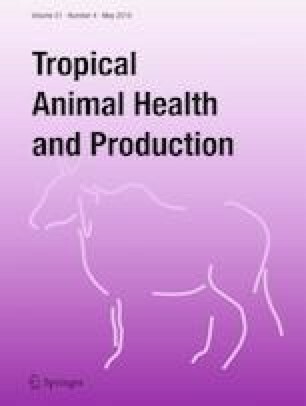 This experiment was conducted to investigate effect of dried Sesbania sesban leaves supplementation on milk yield, feed intake and digestibility of Holstein Frisian X Zebu (Arado) crossbred dairy cows. Twelve cows at midlactation (155.83 ± 4.49 days of lactation), second parity, and 442.21 ± 3.40 kg average live body weight were randomly assigned to one of four dietary treatments according to a randomized complete block design. Cows were blocked according to their daily milk yield into three blocks of four animals each. Cows were fed a basal diet (control) or a basal diet supplemented with 1.25 kg/day dried Sesbania sesban leaves, 2 kg/day dried Sesbania sesban leaves and 2.75 kg/day dried Sesbania sesban leaves on a dry matter basis for 8 weeks. Total dry matter intake, nutrient intake, milk yield, dry matter digestibility, and nutrient digestibility showed significant variation among treatments. Cows supplemented with the highest level of Sesbania sesban (2.75 kg/day) had higher total dry matter and nutrient intake. Similarly, cows supplemented with 2 and 2.75 kg/day had higher milk yield than the nonsupplemented cows (up to 11.3 and 16.2%, respectively). Digestibility was lower for the nonsupplemented cows compared to cows supplemented with 2 and 2.75 kg/day dried Sesbania sesban leaves but statistically similar to the cows supplemented with 1.25 kg/day dried Sesbania sesban leaves. Supplementation with 2.75 kg/day Sesbania sesban resulted in higher organic matter digestibility (OMD) compared to the control. Crude protein digestibility (CPD), neutral detergent fiber digestibility (NDFD), and acid detergent fiber digestibility (ADFD) were significantly affected by Sesbania sesban supplementation. The nonsupplemented cows had lower CPD, NDFD, and ADFD. These results indicate that dried Sesbania sesban leaves supplementation to dairy increases total DM intake, digestibility, and milk yield. We would like to thank Mekelle Agricultural Research Center for granting the laboratory analysis and final write-up of the manuscript. We wish also to acknowledge Holeta Agricultural research center, particularly animal nutrition laboratory staff members for their valuable help in conducting the chemical analysis of feed, feces, and urine samples. This study is financially supported by the Tigray Agricultural Research Institute. The national guidelines for the use and care of animals have been followed.